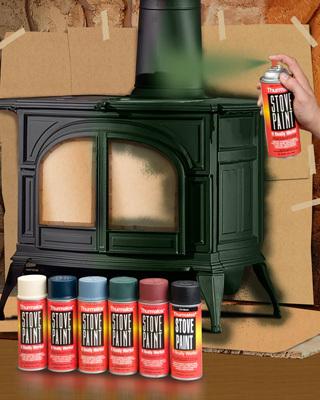 Thurmalox Stove Paint, manufactured by Dampney Company, Inc. of Everett, Mass., is available in easy to use aerosol spray cans, a one pint brushable black, gallon, five gallon, 35 gallon and 55 gallon containers. Our manufacturing facility is located in Everett, Massachusetts. Our products are sold direct and through distribution. This fast drying, long lasting, heat resistant silicone coating withstands intense heat up to 1200F and resists blistering, peeling or flaking. It is an exceptional protective finish for numerous metal items that become hot while in use. Thurmalox Stove Paint enhances stoves and stovepipes, fireplace andirons, screens and grates, barbecues, gas grills and hibachis.